According to S&W the M&P 15-22 .22LR AR15 has been one of their most popular rifles ever however due to proprietary design, you cannot swap out the plastic forend for a sturdy billet forend without a $40 adapter, however I figured out another option. I successfully mounted a Black Rain Ordnance Rifle length quad rail to the M&P 15-22. 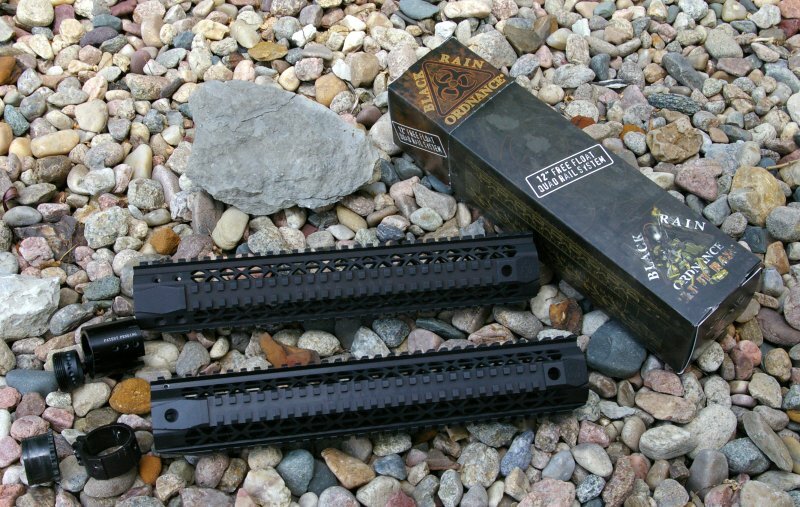 It provides a rock solid true free-float forend, and requires no special or additional parts, does not wiggle or move and mats seamlessly to the S&W M&P 15-22 upper receiver. It does require modification to the upper receiver, a minor modification the rail and this modification works exclusively with the Patent Pending Black Rain Ordnance AR15 quad rail mount. If you are handy with a Dremel tool then this is an easy modification. 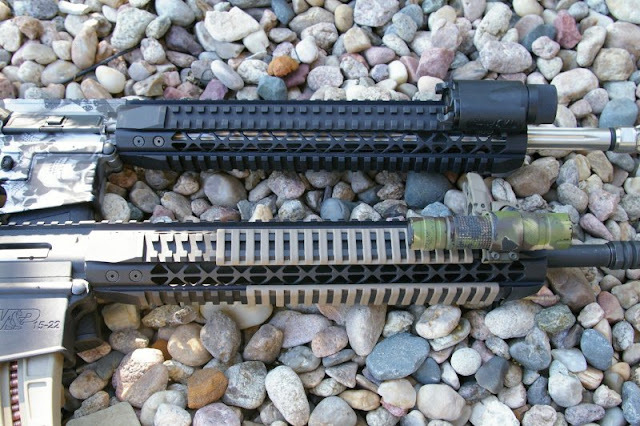 This all came about because I noticed my old Gen 1 4-bolt rail from Black Rain was a little loose. One call to them and they not only offered to send me the Gen 2 8-bolt style and even mount it to my upper if I wanted. Great customer service! The new version with their new patented mount was rock solid and I like it so much I picked up another one for a future project. 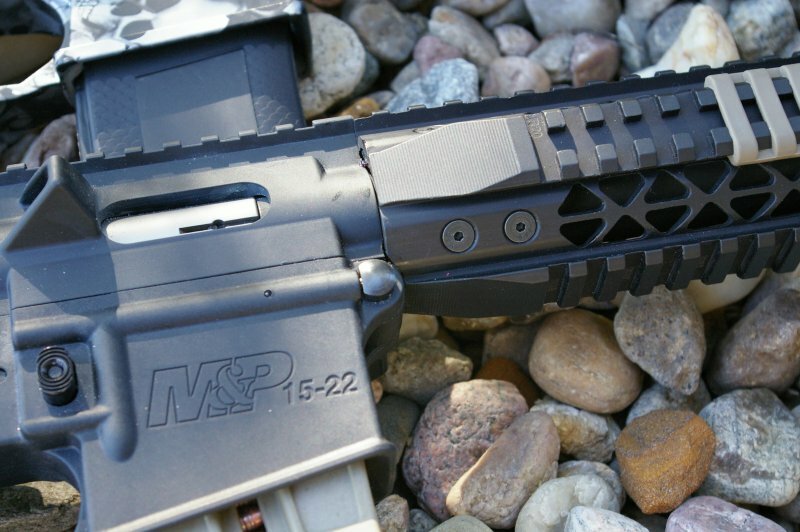 As I played around with the new rail on an ATI .22LR upper, I started thinking that it may work on the M&P 15-22, it did and here is how. Step 1 - Remove the front forend support that makes the floating forend not a fully floated forend. Buy or make a barrel removal tool. I made my barrel removal tool with a 1" aluminum pipe with four teeth cut into the end of it - worked perfect. Remove the retaining nut and forend. There are several videos of people showing how to do this on YouTube. Pay attention to how little force was required to loosing the nut, because you will need to use no more than that to tighten the nut back down. 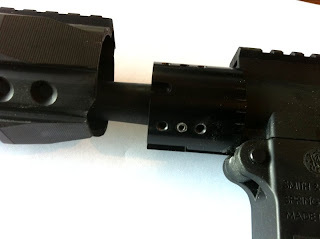 Step 2 - Modify your upper receiver as shown removing the upper and lower protruding forend guides and notch out the front pivot to make room for the forend and nut. I used a Dremel for the aggressive material removal and then used a flat file to assure everything was square. Step 3 - Center the inner Black Rain adjustment nut on top of the stock S&W barrel nut as shown. This is not a perfect fit but there is only a 1/16" difference total between the two sizes and based on all my test fitting should hold in place without any shimming or soldering. 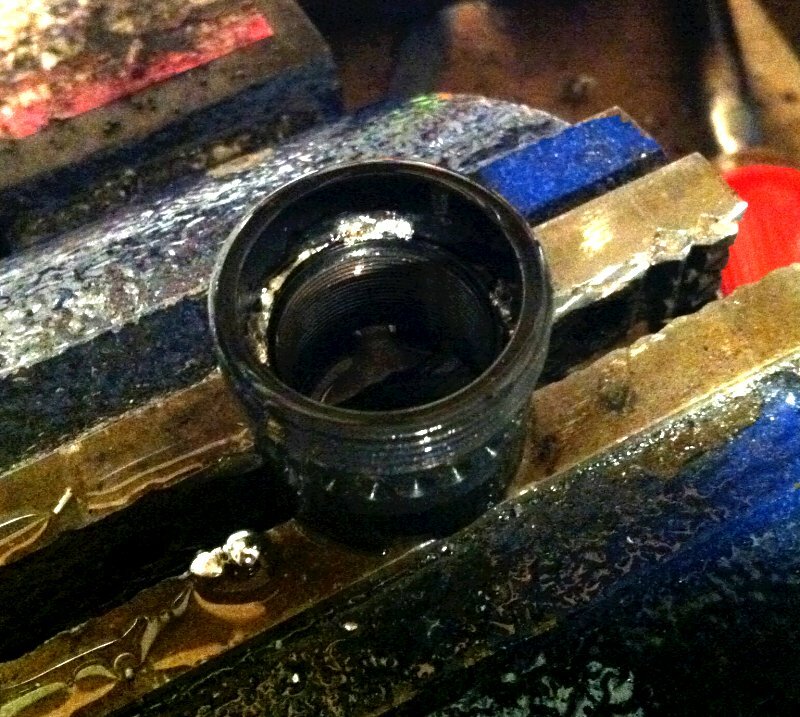 I dropped in shims and soldered it all in place just to assure it was solid. Screw it on to the barrel as shown and tighten down. 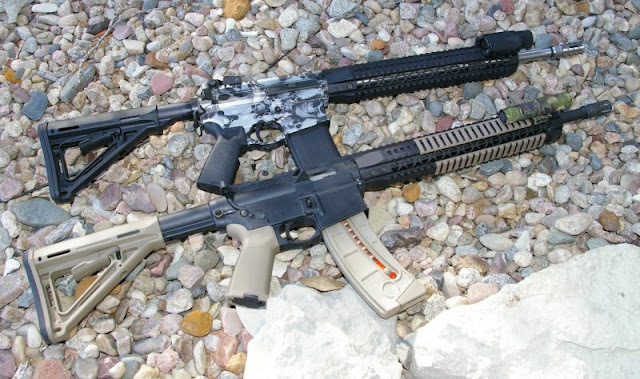 Note this is a polymer receiver so don't go all ape hanger and attempt to over torque it or you will break the receiver. 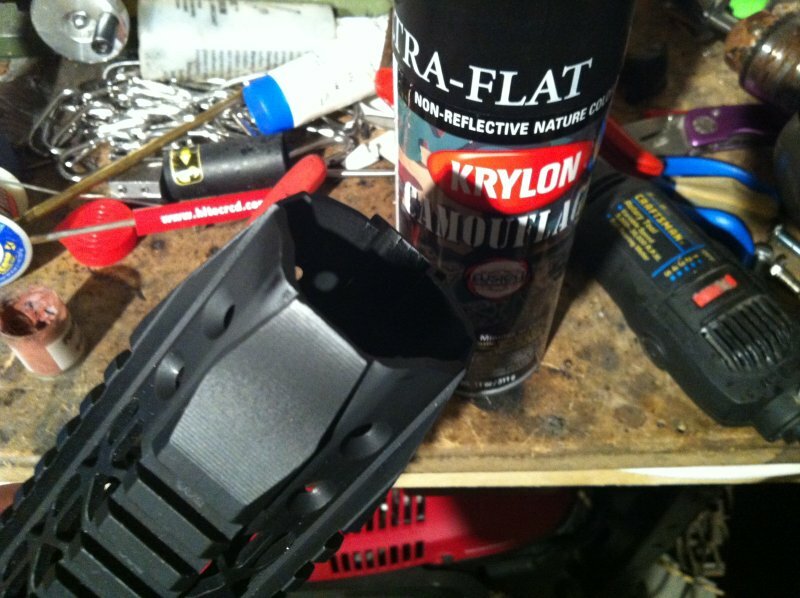 Step 4 - Once you have the nut assembly in place as shown, screw on the outer Black Rain barrel nut retainer and test fit with the handguard and trim the handguard so the it will seat flush with the receiver and allow full range of pivot motion between the two receivers.I hit the ground areas with a little flat black Krylon camo paint to it looked good. 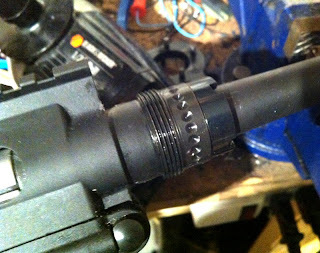 Step 5 - If everything looks good and the forend holes line up with the outer barrel nut, add some Lock-Tite to the inner Black Rain threads and tighten down the grub screws that lock the inner barrel nut and outer Black Rain barrel nuts together in position. Slip on the forend, adjust as necessary and screw on the 8 screws. You are done! Now I have a near perfect analog for my Black Rain Ordnance Fallout-15 AR and all my other ARs with rifle length forends. 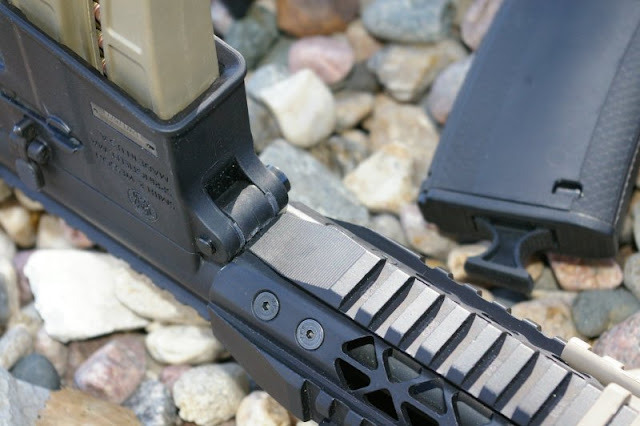 Can you explain how the patent pending quad rail mount exactly works, I'm last on how this is going to install, it seems that the rail mount will need to be torqued but also need to line up so rail matches up with everything. I'm lost. ThisBlack Rain features a teo piece barrel nut. 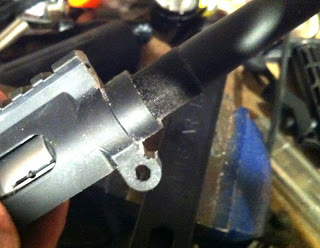 The inner nut is held onto the receiver by the stock mp1522 nut. The outer BR nut is then screwed onto the inner BR nut as normal. Basically the stock mp1522 nut is justholding everything in place. BR is the only company that allows this configuration and adjustment of the outer nut.